I have been very fortunate in having had the opportunity and means to visit South America on numerous occasions since 1984. During that time the only countries I've not spent any time in have been Colombia and Bolivia. 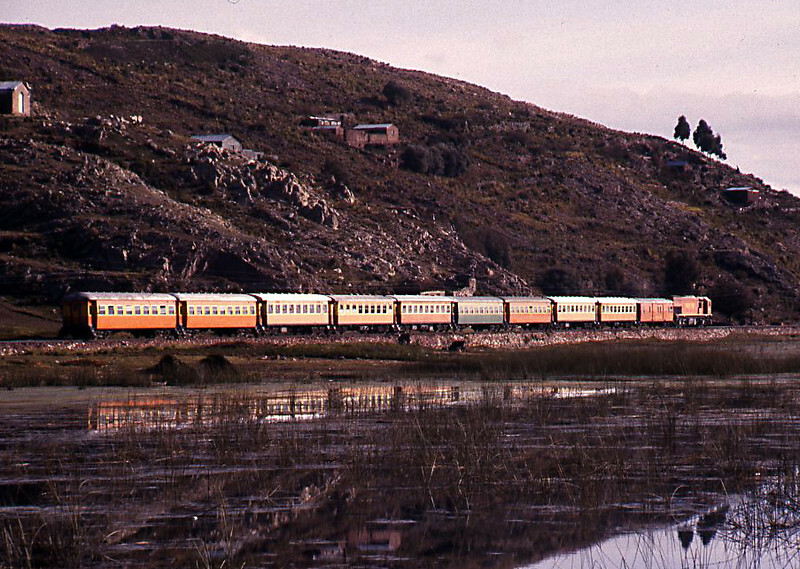 My first visit, in December 1984, was to Peru and featured a train ride from Puno to Cuzco and from Cuzco to Macchu Picchu. At the time I had a tape of the BBC TV Great Railway Journey of the World which saw Miles Kington ride from Lima to Huancayo and on to Huancavelica, Cuzco and Puno. He started from Lima's Desamperados station, where my Peru adventure starts too. At Christmas 1985 I spent a couple of weeks exploring Uruguay, with a few picture taking opportunities in and around Montevideo. And a beach holiday in Brasil in 1987 gave me the oppportunity to shoot a real live Alco RS3 at work as well as ride the commuter trains in and out of Rio's Dom Pedro station. I visited Chile for the first time in 1989, it was just before the election which saw the end of the military dictatorship which had ruled Chile for 15 years, the sense of relief among the population that they were about to bid adios to General Pinochet was quite evident everywhere I went. And in 1990, after visa restrictions were lifted (in place since the Falklands War of 1982), I flew to Argentina and spent a marvellous two weeks chasing trains around Buenos Aires and riding across the pampas to Mendoza, in the foothills of the Andes. It is difficult today to express just how excited I was to have been able to visit both Chile and Argentina in the space of a year. Almost immediately I was home I started planning a second visit to Argentina at Easter the following year, 1991, including a side trip to Paraguay after having seen a Channel 4 documentary on the North British Locomotive Works, which had featured Paraguayan steam. Once again I was not disappointed. 18 months later, courtesy of a British Airway's Autumn Citybreak , I was back in Buenos Aires. Much had changed in my absence, in particular the culling of many of the long distance passenger trains in preparation for the Menem government's breakup and privatisation of Ferrocarriles Argentinos. But there was still plenty to keep my occupied including a day out with Argentine railfan Marcelo Lopez to Mercedes and a ride on a Ferroclub Argentino steam special. I was back again in October 1994, this time for an 18 day holiday to both Argentina and Chile, it marked my last visit (to date) to Buenos Aires. Once again I met up with Marcelo but the scene was very different to my last visit, UEPFP (Ferrobaires) was operating the only long-ish distance passenger trains, Ferro Sur Roca and Ferro Expreso Pampeano were in the freight business and new operators such as TMS were franchised to run commuter services. From Buenos Aires I flew over the Andes for my second visit to Chile. I spent about 12 days chasing trains, mainly between Santiago and Rancagua (80 kms south) using the newly introduced commuter rail service, Metrotren. I also rode the Rapido de Frontera to and from Puerto Montt and spent a day in Valpariaso courtesy of Tur Bus. In Autumn 1998 I returned to Chile on a family holiday which took in the Atacama and the Lake District but which allowed me for the first time to visit Tocopilla, where my mum was born and Antofagasta, the HQ of the FC Antofagasta y Bolivia. It was six years before our next South American adventure and it was again to Chile, this time in December 2004 to celebrate a landmark birthday - one of those with an 0 involved - much of it was spent in the far south, in Magallanes and on Tierra del Fuego but we started in the north, in Antofagasta and Tocopilla and on my birthday itself we rode Metrotren to San Fernando. Our last visit to South America in my 'pre-digital' era was in January 2006, to Panama and Ecuador, which includes a brief look at the Kansas City Southern-controlled Panama Canal Railway and the Ecuadorian State Railway's (ENFE) three times weekly service from Riobamba to Alausi and the ride down the Devil's Nose. ENFE was almost moribund at the time (lots of money have subsequently been spent restoring sections but I'm not sure how much joined up service is actually provided) with just this operation running with any certainty. Since going digital I've been back three times, to Brasil in 2007 and to Chile in 2012 and again in 2014, the pictures from those visits can be found in their respective year folders, with the 2014 pictures displayed in the Winter 2014/2015 (Part 1) gallery. A little later the daily train to Cuzco, which we would catch in a day or two left heading towards Juliaca.